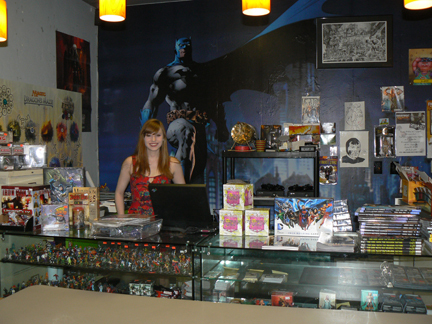 Gotham City is low-key, fun, and filled to the rim with comics, action figures, toys, video games, and knowledgeable staff. My favorite feature, of course, is the Espresso Bar serving comic-themed coffees and Italian sodas. It’s just a small stand in the midst of geek heaven, but trust store manager Jaime to create you one delicious drink. Owners Kevin and Miguel met in high-school and still share common interests: “devouring” comics, selling toys online, and playing Magic: The Gathering. They used to work together at another well-known comic store. 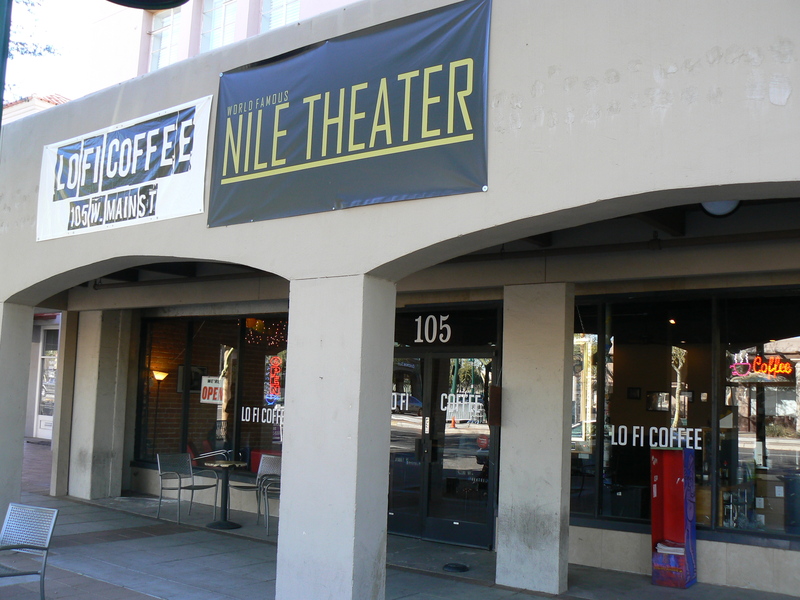 When it closed, they saw an opportunity to buy an existing coffee shop in downtown Mesa featuring a few comic books. 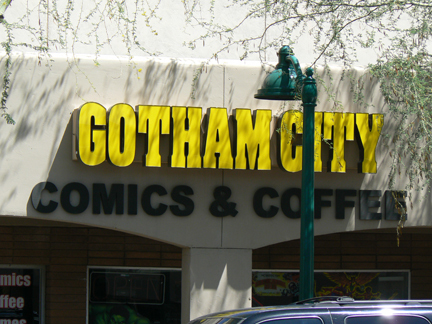 They started Gotham City Comics & Coffee in December 2010, and watched the business morph from a coffee shop with comics, to a comic book shop with coffee. The Espresso Bar features locally roasted coffee from Cortez Coffee Company—a coffee grower, roaster, and full coffee academy, in Tempe, AZ. Gotham’s drink options are unique and delicious, including Italian sodas. They also sell chips and candy. More tea selection would float the boat of this Tea-vangelist, but what they offer should more than fulfill anyone’s specialty-drink palate. They offer free Wi-Fi, and plenty of seating and electric plugs. 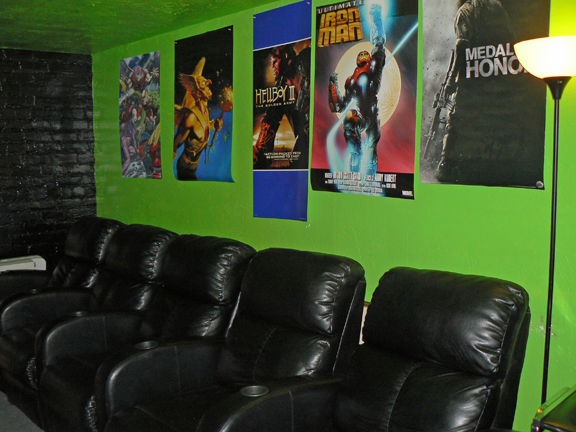 In the back, there’s a game wall in a cushy-chair video game room, rentable for just $5 per hour. It looks great for parties or groups. “Friday Night Magic: the Gathering” play every Friday evening of the month. P.S. You can meet Kevin and Miguel—plus “Garbage Pail Kids” artist Mark Pingitore—at the Phoenix Comicon‘s Gotham City Comics & Coffee booth #374, May 24–26, 2013. I love connecting people and ideas, so I’ve been creating small villages my entire life. Really, what better places can writers and musicians find to create “village” than independent coffee/tea shops? I wrote most of my Rhythms & Muse novel and Delfaerune Rhapsody series-in-progress in coffee/tea venues, so it seemed natural to create this blog. Whether you came here to find a new favorite hangout, or suggest a spot not yet not posted, may you find Coffee CommuniTea exactly to your taste! Courtyard seating. 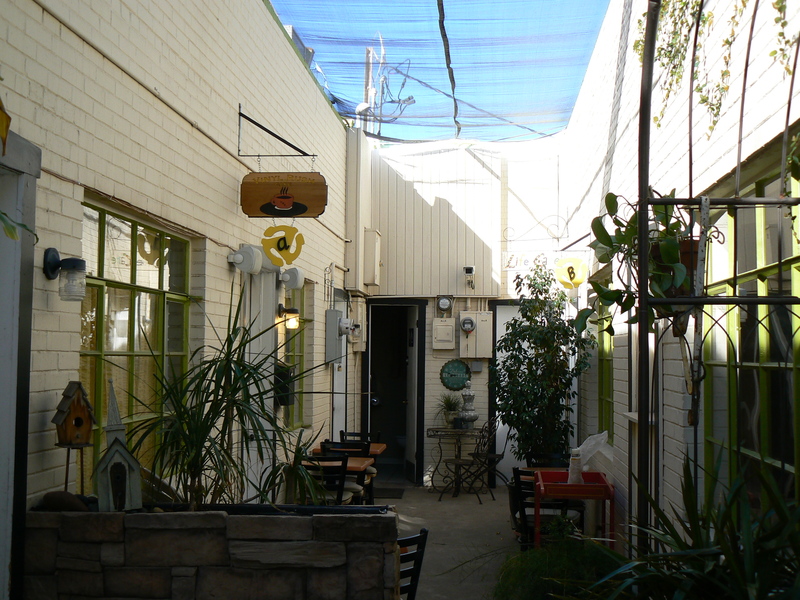 A cute, narrow courtyard between the rows of small businesses in the building. Intimate setting. “Side A:” the coffee bar where you order your goodies, and “Side B:” a room across the courtyard where you can sit, chat and listen to music away from the sounds of blenders and counter chatter. Album clocks. The owners decorated with lots of charming music paraphernalia, including a large collection of vinyl record album covers—33s and 45s—which they’ve turned into clocks. Missy, one of the owners, is both a coffee and music lover. She and her coffee partner bring you 38 years in the restaurant, hotel, and retail industry. 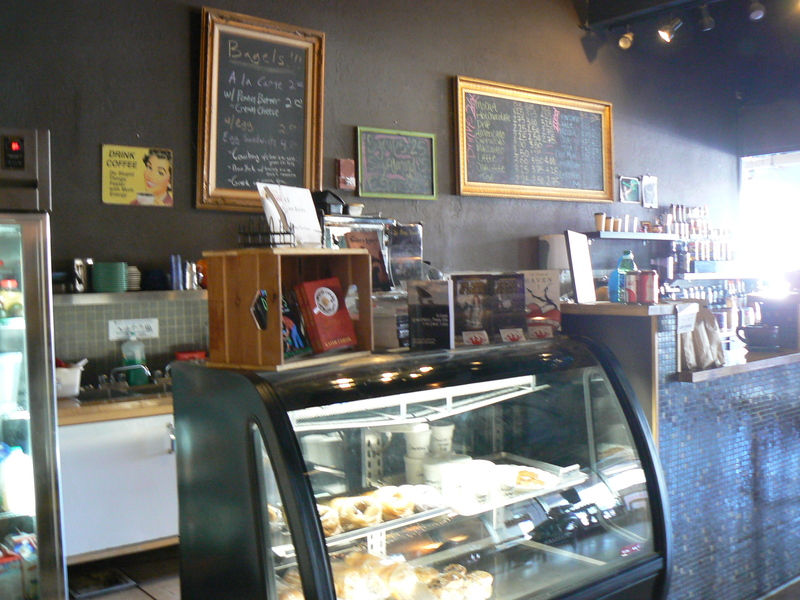 At Vinyl Rush, they roast their own coffee beans, favoring full-bodied, medium-dark to dark roast styles. Just be ready for it! Not a thing. Just be prepared to enjoy your goodies in a close, intimate setting. 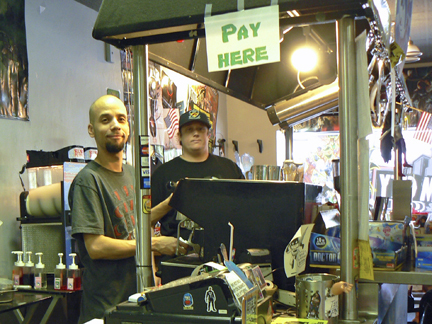 Monday – Friday 6:30 a.m. – 3:00 p.m.
Who recognizes the symbol under their “Vinyl Rush Cafe” signs? Monday-Friday, 6 a.m. to 9 p.m. 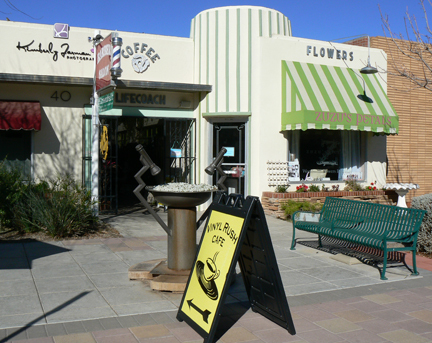 This eclectic destination in the downtown Mesa, Ariz., area serves an assortment of natural and organic items. It is known for its award-winning Veggie Sandwich, Chicken Waldorf, and Chicken Curry, and also offers vegan-friendly items like a Thai Peanut Tofu Wrap and a Vegan Curry. This spot is certainly unique. 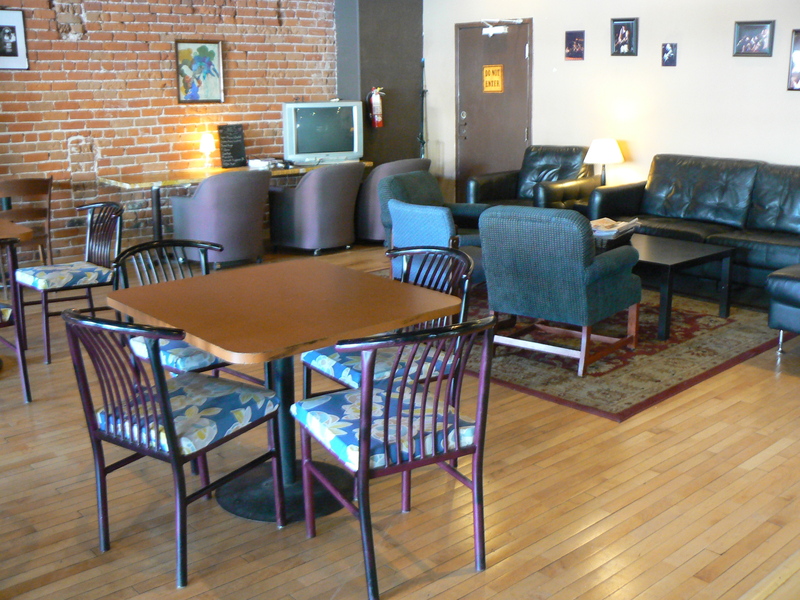 Not only does it offer a charming, artsy, inviting atmosphere, plus a variety of good coffee, teas and foods, but it is also a unique setting to enjoy yoga, workshops and more. 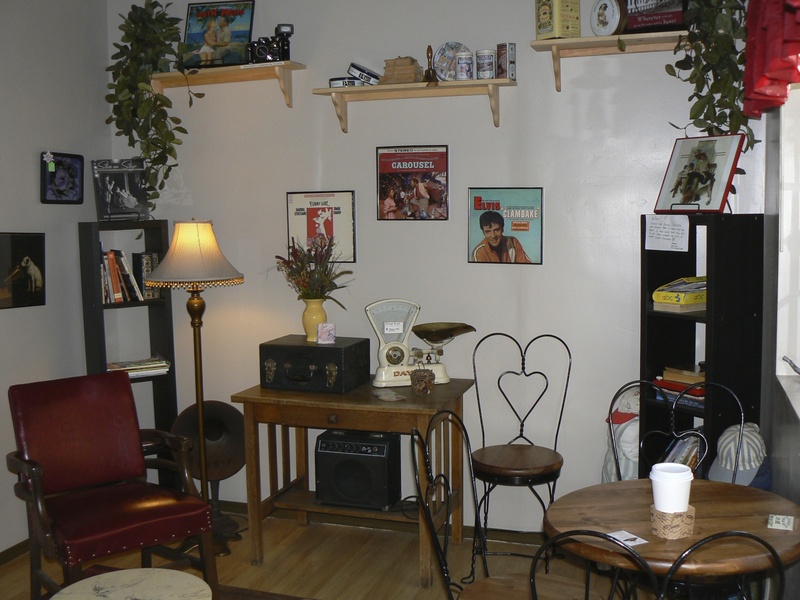 The yoga studio, housed in a 1923 bungalow style home, is behind the cafe. Its original hardwood floors, a charming fire place, and French doors open onto an outdoor courtyard filled with orchid trees, bamboo and water features. Leash and Latte Hour, Mondays from 6p.m. to 8 p.m. Come with your favorite canine friend and receive 1/2 off latte specialty drinks. Open Stage, Wednesdays from 7 p.m. to 9 p.m. when you can enjoy and participate in a night of singing, poetry and comedy. Inside the Bungalow also sports quite a long list of awards including several Best Coffeehouse awards, Top 5 Yoga Studios, and One of Valley’s Best Mom & Pops. I also like that they work to lessen their green footprint by striving for new ways to support coffee and tea growers, their communities, and locally owned businesses.